Just about everyone is familiar with maple trees. Four species in particular are more-or-less common across the ceded territory, occurring in a variety of wooded habitats. Sugar maple or ininaatig (Acer saccharum) is highly shade-tolerant, and a dominant of northern hardwood-conifer forest. 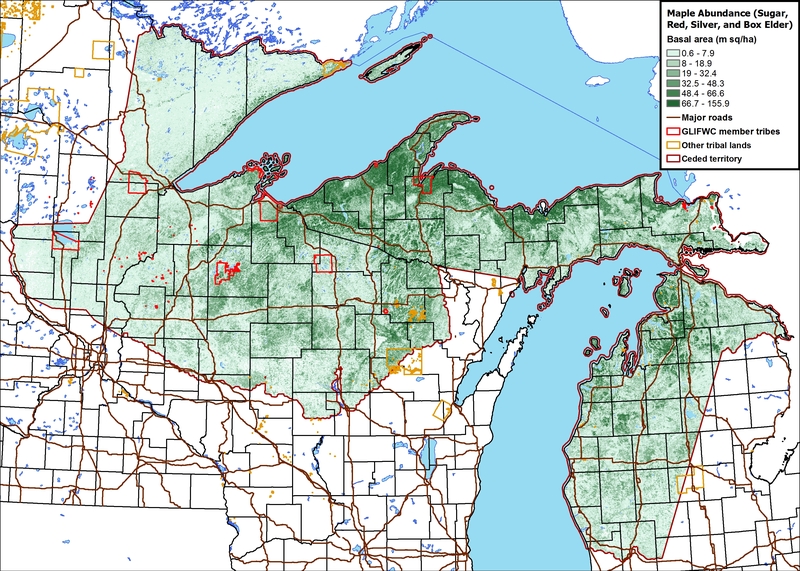 In the eastern part of the ceded territory, west to Marquette County, Michigan and along the east shore of Wisconsin, it is often codominant with the equally shade-tolerant American beech (Fagus grandifolia). In some portions of its range it also shares dominance with eastern hemlock (Tsuga canadensis). Red maple or zhiishiigimewanzh (Acer rubrum) is also common across the ceded territory. It is only moderately shade-tolerant, but is able to tolerate poorer soils and a wide range of soil moisture. 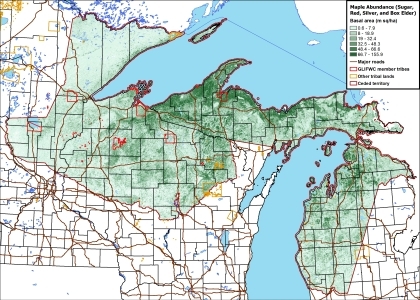 It grows on diverse sites including sand plains, open pine forests, lakeshores and wetlands. Silver maple or zhiishiigimewanzh (Acer saccharinum) and box elder (aajaagobiimag; Acer negudo) typically inhabit floodplains. Both tolerate seasonal flooding but avoid continuously saturated soils. Both are only moderately shade tolerant. Box elder can be weedy too, colonizing fencerows, old fields, abandoned city lots, and other disturbed areas. One more maple species may be relevant to the establishment and spread of the Asian longhorned beetle. Norway maple (Acer platanoides), is a European maple that is a popular shade and street tree in eastern North America. In some parts of the country (especially the eastern US) Norway maple has become invasive in woodlands. Like native maples it is highly susceptible to the ALB. Maple sugar was one of the most important plant foods of the Ojibwe (Densmore 1928). Sugar maple was preferred over other maple species because the sugar is more concentrated (Joe Rose Sr., pers comm.). The spring sugarbush camps were a time for families to gather and celebrate the coming of spring. Each family or small group of families had their own sugarbush, and the camp and structures were repaired as necessary and used from year to year. This tradition has continued into the present, with sugar camps sometimes being passed down for generations. 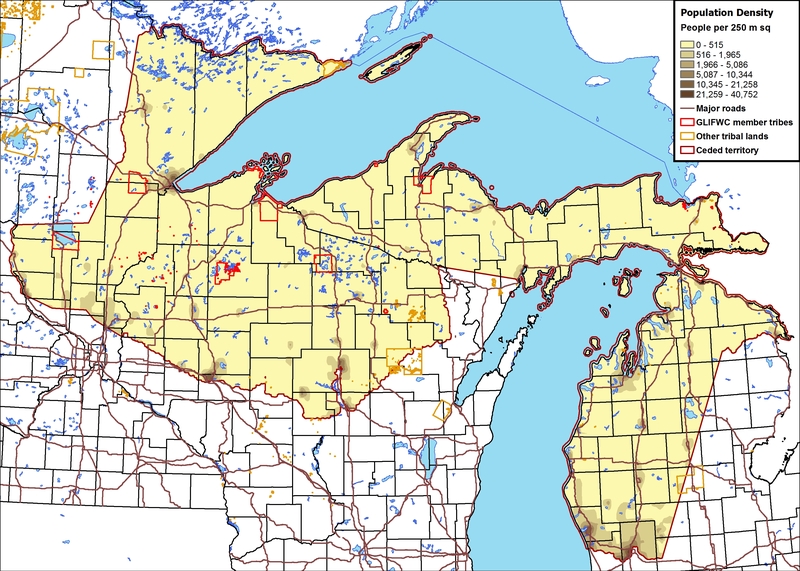 If they ever become permanently established, the Asian longhorned beetle, Anoplophora glabripennis (Motschulsky) and the nearly identical-looking citrus longhorned beetle, Anoplophora chinensis (Forster) present major threats to North America's hardwood forests. The Asian longhorned beetle is native to China and Korea, while the citrus longhorned beetle is native to both these countries as well as Japan (Haack et al. 2010). Unlike most wood-boring beetles, both of these beetles are capable of killing healthy trees. Thanks to human movement of nursery trees, raw lumber, and solid wood packing materials, the ALB is now established in locations around the world. The ALB first appeared in North America in 1992, when ALB-infested wood was intercepted at Loudenville, Ohio and in Vancouver, BC (Haack et al. 1997). It wasn't until 1996, though, that an established population was found in North America, when a Brooklyn, New York resident reported that the Norway maple trees in front of his house had holes in their trunks and branches, and also reported several large, dark beetles (Haack et al. 1997). Thinking the holes were the work of vandals, he called the New York Department of Parks, which sent a city forester out the next day. The forester sent a specimen to Cornell University, where it was identified as the ALB. The USDA-APHIS was notified in September 1996. By following the movements of arborists and firewood dealers, a second infestation was soon found in nearby Amityville. An eradication program was formulated, and by October 1997 1,450 infested trees had been cut down, chipped and burned. The next infestation was detected in the Ravenswood area of Chicago in 1998, when a resident had noticed the beetle on firewood he had gotten from a neighbor, who had cut limbs from a tree in his yard. (To read the story of how the residents of a Chicago neighborhood came together to fight and successfully eradicate the ALB, see Chicago vs. Asian longhorned beetle: A portrait of success, by July Antipin and Thomas Dilley.) The resident found the beetle online, called the APHIS hotline, and a few days later the beetles were identified as the ALB. The Chicago population was declared eradicated in 2008. Subsequent infestations in several urban areas have been eradicated, including the Toronto infestation, which was declared eradicated in September 2013. 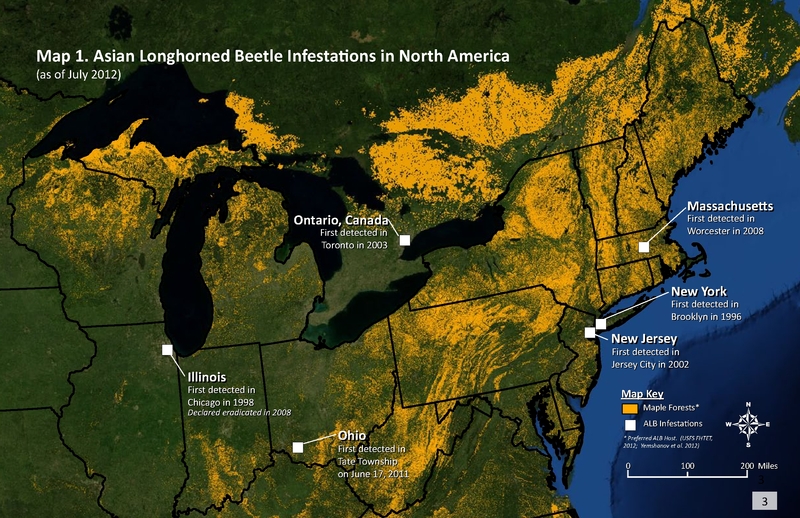 (See Asian Long-horned Beetle Eradicated from Canada, by the Canadian Food Inspection Agency. Unfortunately by the end of the same year a new infestation was found in a Toronto suburb. Populations in New York, southern Ohio and Massachusetts are also still being eradicated. The Ohio and Massachusetts infestations are much larger than previous ones, with 61 and 110 square miles quarantined, respectively. 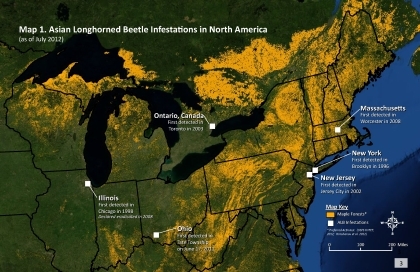 If the Asian longhorned beetle (ALB) ever becomes permanently established in North America, it would devastate the continent’s maple forests and all but end the spring sugarbush harvest. If maple isn’t available, the ALB will attack several other trees including birch. The ALB has a strong tendency to show up in large urban areas, hitchhiking in solid wood packing materials in shipments from overseas. Human population density is a likely surrogate for the amount of imported goods reaching a given city or town. 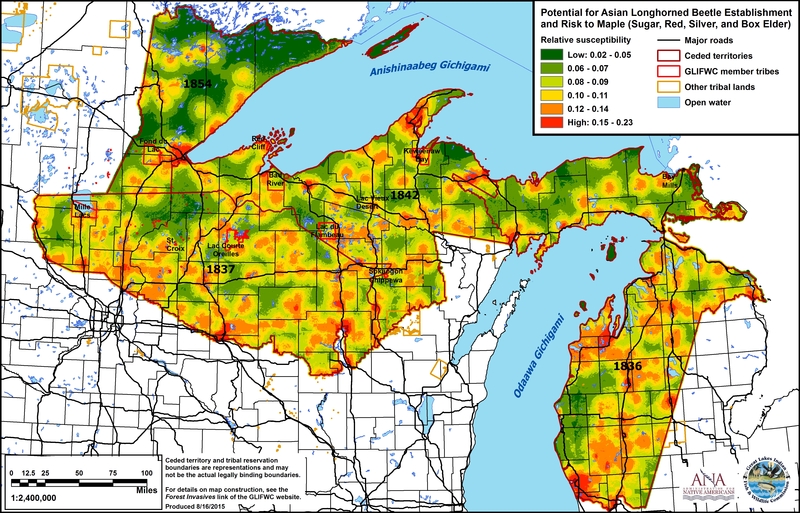 Another obvious factor is abundance of maple (see map above). 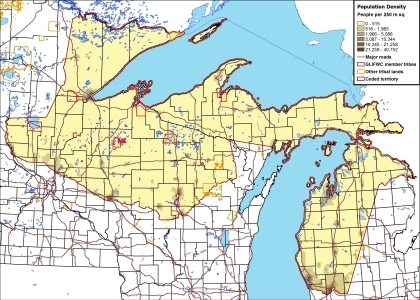 While the ALB strongly prefers maple as a host in eastern North America, it CAN use birch, elm, aspen (popple) and several other hardwood trees if maple isn't available. Thus very few urban or rural areas have zero risk of establishment. Major road corridors may also associated with the long-distance spread of ALB. This risk map shows predicted total maple susceptibility to infestation by ALB in the ceded territory. Relatively high-risk areas are again shown in red, grading to pink and yellow for moderate-risk areas and green for low risk areas. Low-risk areas are farther from population centers and major roads. 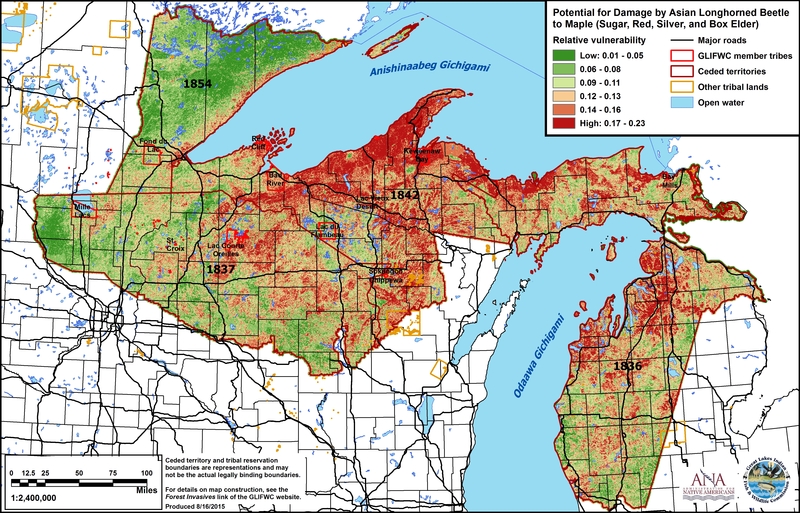 This map shows predicted total maple vulnerability (or long-term risk), if the ALB gets established. Relatively high-risk areas are again shown in red. 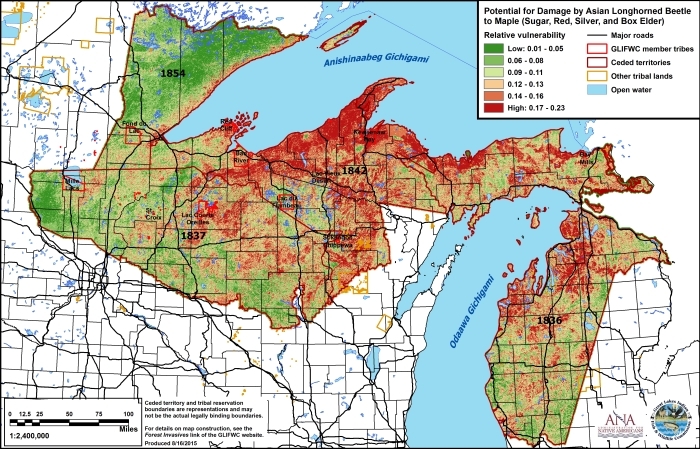 Areas with lots of maple generally have the highest risk, while areas with little maple have low-risk. 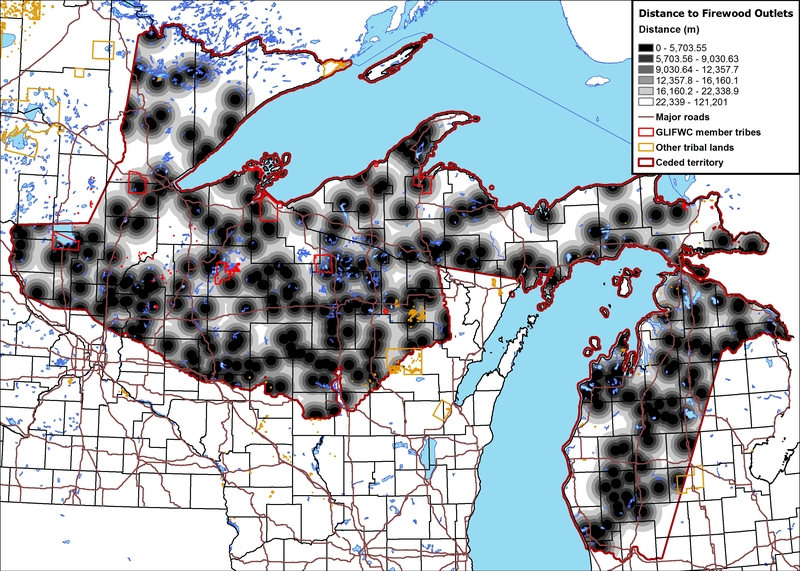 Maintained by USDA-APHIS, this is the go-to site for information on Asian longhorned beetle identification and biology, how to recognize infested trees, where to report possible ALB sightings, and eradication efforts. Information and links pertaining to the ALB. Links to current news and information, outreach materials, maps, images, and other useful information.